Let’s talk about enterprise business intelligence. Is self-service BI sufficient as the sole component to cover enterprise readiness for business intelligence? I have taken part in many discussions lately on whether the popular self-service BI components can do the trick when it comes to enterprise-wide insights. Of course, people representing the likes Tableau, Qlik, or MS PowerBI will say they do, but my customers are not so sure about that. Let’s take a look and learn that enterprise business intelligence—having full 360° insights for all types of users—is more than just self-service BI. I have been writing extensively about self-service BI and how to use it to win your end users. Self-service BI definitely covers a wide audience of information consumers in a very powerful way. It talks to a very specific audience—primarily end users who consume insights based upon governed data. It also talks to data analysts who might use governed corporate data and blend that with other—corporate or non-corporate—data. But is it enough to cover all needs for insights in your enterprise? No, not when an enterprise requires to cover full insights to any type of users. What do enterprise insights mean? perspectives on the fly. Accuracy is real-time. Tactical level: The tactical level is about users who deploy a company’s strategy onto concrete business follow-up. The scope is within a process or a group of processes. Users require the ability to interact with the data even at transactional level, and in on-line mode. They require status insights via bursted and scheduled reports. They require interactive and governed dashboards with alerting or even streaming data; they need to change the perspectives of the insight in online and real-time mode. They also must be able to answer ad-hoc queries so they should be able to quickly enrich, blend and join with other data sources while still running in a governed mode. The latter is typically done by data analysts who need to be able to touch and analyze every single data element, but also require to access other (non-) corporate data. Operational level: This level aims at users who require data insights to fulfill their day-to-day activities. Often these are operational activities. The insights are typically provided by reports that are scheduled or bursted towards them. The user can interact with the report (filter, sort, comment, adjust, etc.) and might even be willing to print or mail it. But it is not only reports; think, for example, of real-time dashboards hanging on the ceilings of manufacturing plants indicating performance or alerting for system failure or other incidents. Another level of operational insights are the IT administrators monitoring data quality and using online BI tooling to browse and explore their core data sources. We can summarize the above in the following model. All users act within this model and either require strategic, tactical, or operational insights to get the enterprise moving. At any moment in time or in the process, people can access the BI portal to either console or share insights. Any of these insights can be consumed, annotated, or shared via mobile devices. I am a big fan of self-service analytics components, as indicated in my articles on How To Win Your End Users and Buffet Or A La Carte. But do they cover all required insights expected from an enterprise business analytics platform? No, they definitely don’t, and I’ll tell you why. Self-service BI tends to cover pieces of the strategic and tactical levels, but it leaves out the operational level, along with some important functionality applying to all levels. 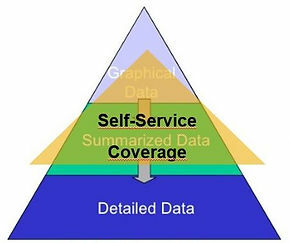 I have indicated where self-service BI fits in the bigger MAD framework using the yellow triangle in the figure below. I have listed a generic overview of things and capabilities not covered by self-service BI. It is generic since some software vendors do have some functionality. The overview is in random order and is certainly not exhaustive. Scheduled and bursted reports: Many users require scheduled reports providing specific insights. These reports could be alert-based, meaning the only are sent once an alert-definition is met. Don’t underestimate the volume of these kinds of insights. Especially in finance, supply chain, order management, IT, and manufacturing, lots of users consider this functionality as absolutely essential. Bursting is another example of using one report template that is automatically populated and sent to a list of users with data that applies to them personally. Think a bank sending the performance of a stock portfolio to each of their customers automatically each week. There is only one report for this, and it is re-created and reprocessed for each individual customer. Public distributed insights: Some enterprises—government is a good example—must share insights with the public in either report or dashboard format. People accessing these insights can often interact with them by filtering or changing perspectives. 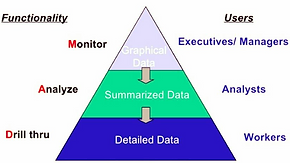 To do so, the insights pass the governance layers and typically access a dedicated semantic layer. Semi-public content—i.e., distributed to the public only once registered—apply to the same model. Most self-service BI components are not capable of doing this. Blind data discovery and monitoring: Though self-service BI provides data blending and mashup, there are users who browse and explore corporate data on a real ad hoc basis, typically on a transactional level. Think of users in financial consolidation and order management, or IT data stewards. They require BI functionality to browse systems online and data on the fly; they skip from record to record and from system to system. They search data, filter it, and highlight insights. Though this seems to be possible with self-service BI, day-to-day practice shows these are not sufficient as they often are not governed to access the core operational systems that apply. Detailed report layouts: Some insights require pixel-perfect detail or advanced layouts with headers, footers, groupings, or sections. Think about operational and formal reporting to be sent to customers or vendors; for example, a customer invoice or a SLA performance report for vendors. Receivers tend to print these reports. They need to be high-resolution (logos, guidelines, specific rules, etc.) and can have a tremendously detailed layouts with varying sections, and they can be bursted. Institutions and governments in particular require formal reporting that includes highly detailed formatting specifications. Tile-driven alerting: At the upper strategic and upper tactical levels, users require tile-driven alerts, driving them to action upon in a certain process. These are typically seen on mobile devices, allowing the user audience to be instantly informed the moment the trigger for an alert goes off. The tiles are interactive and quickly guide to a self-service or managed dashboard for further investigation. Integration with business planning: When it comes to the closed-loop portfolio of analytics, many self-service tools “throw in the towel.” An example of integrating BI with business planning applications is simply comparing actuals with budgets. Doing this in an integrated way (cross-referencing to both applications) is possible only when using dedicated components that not only integrate data sources but also include APIs to the applications themselves. Streaming data insights: Some insights require streaming data sources. Of course, these include IoT devices, but examples also include manufacturing machines that stream data on what they produce or what incidents occur, and social media feeds. Generating visualized insights for these streaming sources requires components that can handle SDS (streaming data source) components and that allow for immediate alerts. Production applications: Especially on the operational level, enterprises need insights on performance. Think of the large screens and monitors within production plants or call centers that measure query lanes, activities processed, or incident alerts. These are typically handled by streaming washboarding applications that run in real-time mode. They run 24/7, are strongly visually oriented, and based on alerts or thresholds. The above list is by far from complete, but the point is, you often cannot find priority requirements for all insights in self-service BI; hence my statement that self-service BI is only a subsection of enterprise analytics. It covers a lot of things users want, but it misses a lot, too. I am not convinced that large and medium-scaled enterprises can do with self-service BI solely; they would miss half of what they should know. Below is a little demo movie I made for you that highlights the workstream of a typical enterprise BI flow. It starts on strategic level with managed washboarding and drills into tactical level, where the user needs to blend corporate with non-corporate data. Our user also needs some operational reports for his insights. In the end, the user generates a new insight based upon storytelling and shares this with all users via a portal and via mobile devices. Enjoy! For more BI strategies, see Analytics Teams: Own The Business Problem, Not An Infrastructure.